80458 is also an example of the final type of Travelling Post Office Tender vehicle, but differs in that it is fitted with guards accomodation and a hand brake (such vehicles allowed TPO trains to run formed solely of TPO vehicles, but they were relatively rare and often TPOs ran with standard guards brake vans). Built at York in 1967 it was the second of a small batch of tender vehicles built with a guards brake compartment. It was to the later design (with smaller windows), and never had steam heat or vacuum brakes. In later years running on the West Coast Main Line it remained in service until the end of TPO operation in January 2004. RVP always intended to purchase one of these vehicles and two members stepped in to allow that to happen. Purchased in 2006 it remained at Euston awaiting delivery until November 2007, when it arrived on the GCR. Its restoration to working order involved extensive body repairs and the fitting of vacuum brake equipment. It entered service in January 2009 and runs with 80301, 80349 and 80438 as part of our Mark 1 TPO project. 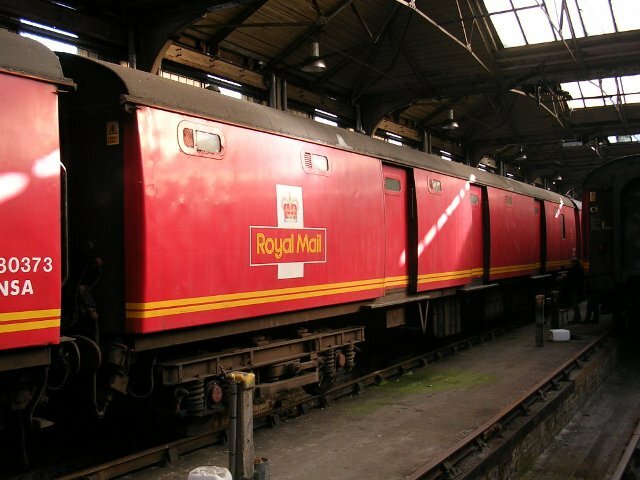 A repaint in 1960's Royal Mail red livery is planned for 2009.